Namaste! When it comes to working out, yoga does more than just burn calories and tone muscles. It also works the mind, combining strength and stretching with deep breathing and meditation or relaxation. Yoga improves your overall health, heal aches and pains, and keep sickness at bay. It can improve your flexibility, perfect your posture, and it’s even been said that yoga can make you a happier person overall. Here are the 10 best yoga studios in Indiana for when you need some peace of mind and relaxation. Here at Peace of Yoga, your practice is as individual as you are. The class sizes are small to give each person individual attention and to help them find their balance, both inside and out. The studio offers all levels of yoga, from Yoga Basics (levels one and two), to Gentle Vinyasa which helps to increase flexibility and circulation. It’s about bringing inner peace and taking what you learn on the mat and applying it to your everyday life. Indiana Yoga Studio in southern Lebanon, Indiana, teaches not only the physical postures of yoga, but they also teach breath work, meditation, Ayurveda and nutrition, as well as how to make basic life changes. Their mission is to make Indiana Yoga Studio the yoga destination for the Midwest and help others to take control of their health. 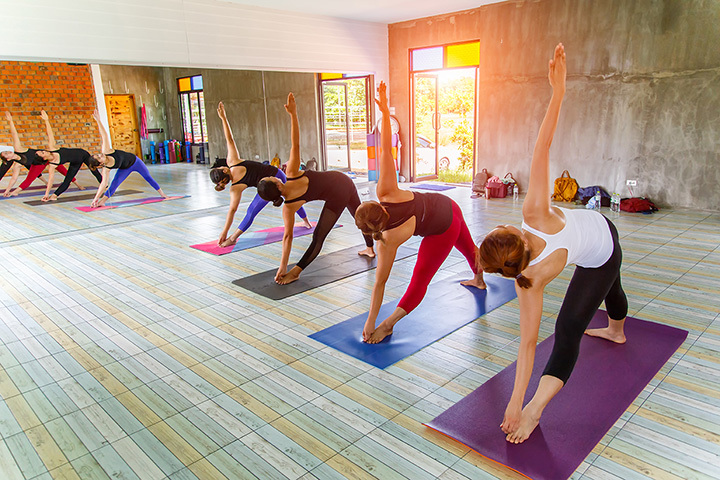 In addition to basic or traditional yoga, they offer classes in heated sunrise yoga, Yin Yoga, and the popular Barre Above, which is a combination of yoga, Pilates, and traditional ballet. There is even a Kids Yoga class for the little ones. The Yoga Studio was founded by Karen Fox, and is one of the most recognized teachers within the yoga community throughout Indiana. She opened her first studio in 2007, and three years later opened the studio in Carmel. She believes in sharing yoga with as many people as possible, and teaching about the positives that yoga can have in one’s life. Here at the Yoga Studio, there are a variety of classes to choose from to find one’s inner peace, such as the ever popular hot Vinyasa or hot yoga, power yoga, restorative yin, yoga boot camp, and yoga meets Pilates. No matter your yoga preference, there is a class for everyone here at the Yoga Studio. Vibe Yoga Studio in southern Bloomington, Indiana, is a community of inspired practitioners of yoga, knowledgeable instructors, and a great staff. At Vibe Yoga, there are over 80 classes a week and more than 14 different formats to choose from. They also offer custom classes as well in which yoga enthusiasts can choose their time, location, instructor, and so on. Choose from Honey Flow Yoga, Align and Restore Yoga, Hot Hip Hop, as well as Prenatal classes. The studio also offers an in-studio boutique and a wellness center. Yoga on 45th offers classes in the traditional yoga styles in a safe, friendly environment with experienced, knowledgeable and well trained instructors. Here, you will learn alignment, breathing, meditation, and how to modify poses to fit your body type. Here at 45th, yoga is for everyone. They offer Beginners Yoga, which teaches the very basics of yoga, Candlelight Restorative Yoga, Hatha Yoga or Hatha/Flow classes, Flow Yoga, Yoga Mixed Level which is a step above beginner’s yoga, and again the very popular Hot Yoga. At Spacious Heart Yoga, the philosophy is to enjoy yourself in a warm and welcoming environment. Everyone is welcome, no matter your level of experience. Spacious Heart Yoga was built on the idea that connection is a human desire, and at the studio, it’s about building connections through a common practice. They offer 32 classes in a variety of Hatha Yoga, and they also offer Trauma Care Yoga, as well as Pre-and Post Natal Yoga. Here at B Inspired Yoga Studio, it’s about more than finding strength in your body. It’s about finding the mental strength to recognize yourself and embrace that person. It doesn’t matter what you wear, what your body type is, or if you even have a mat. It’s about being you. B Inspired Yoga offers chair-based yoga classes, prenatal classes for expecting mothers, preschool yoga, Hatha yoga, Yin and Vinyasa yoga, as well as high-intensity power sessions. You can even have a Yoga themed birthday party! Studio Seva in northern Fort Wayne, Indiana, offers more than just your traditional yoga classes. Have you ever wanted to try yoga using aerial hammocks as props? Try their Aerial Yoga class. The latest trend in yoga is the Yoga Rope Wall, which uses ropes for alignment, support, strength and flexibility—a perfect class for beginners. And if you’ve ever dreamt of flying and performing in a circus, Studio Seva teaches Circus Classes, including Lyra, Silks, Rope, Trapeze, Cloud, and Loops. This is a great way to build upper body strength and stretching your muscles. Exhale Yoga Studio is community focused and strives to create a nurturing environment where all levels of yoga enthusiasts can come and find what they need. It’s a place to let go and a place to grow. Anna and Lindsay believe in bringing out the best in their students and helping them find that inner peace through the journey of practicing yoga. Classes include Chair Yoga, Barre, Gentle Yoga or Lunch Express Yoga, Restorative Yoga, and Stress Relief Yoga. At Evansville Power Yoga, it’s a place to not only get in a great workout, but to also follow your heart and be yourself while pushing yourself beyond your limits. It’s a place to form lasting friendships through the bonds of yoga. At EPY, it’s about finding balance, strength, and spirit. Students are encouraged to make modifications with each of the poses and to rise to the challenge of conquering each pose. Classes offered include Lunch Power Vinyasa, Stabilize Chair Power Yoga or Easy Power Yoga, and Power Basics.